Shahi Tukda is a Mughlai dessert prepared with breads, fried in butter or ghee and soaked in kheer topped with plentiful dried fruits. I first had shahi tukda at my own home cooked by my mother, she having learned the dish from a Muslim neighbour of ours. 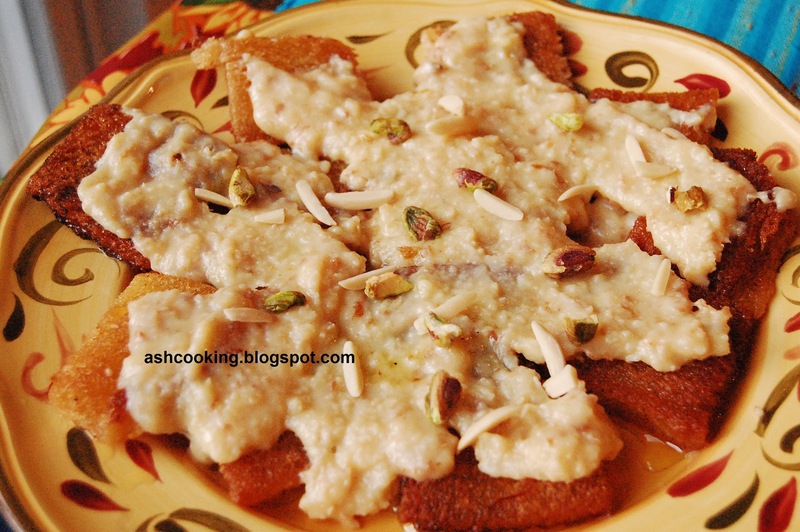 As the name suggests, Shahi Tukda is indeed cooked in a shahi or grand way with dollops of butter and ghee used for frying the breads and the milk thickened in consistency through continuous moderate heating, sometimes, condensed milk used to enrich its flavour and garnished with generous amount of pistachios and almonds. This dish if served in a party is going to earn you copious appreciation from sweet loving guests. 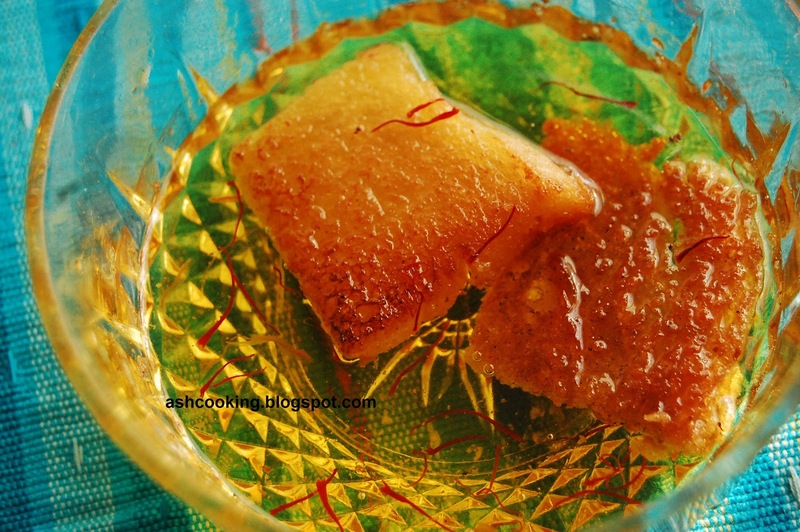 It has that fulsome flavour, the crispy bread turning soft after soaking up the syrup and subsequently covered in kheer providing an enriched melt in the mouth experience at each mouthful. 1) Heat the milk over high flame and bring it to a boil, stirring occasionally, if using a non-stick cookware. Lower the flame to medium and keep heating the milk until it reduces to 1/3rd in volume. 2) Add 1/2 cup of sugar, cardamoms and stir in. Continue heating the milk, stirring continuously until it reaches kheer like consistency. Turn off the flame and keep it aside then. 3) Meanwhile, in a microwave safe bowl, pour 1/2 cup of water, the remaining 1/2 cup of sugar and a pinch of saffron. Heat the mixture in microwave oven for 5-8 minutes till sugar completely dissolves. Set the syrup aside. 4) In a non-stick pan, melt the butter on low heat and add the bread squares. Fry them on medium heat till they turn crisp and golden brown in color. 5) Now dip the crunchy bread squares in the saffron infused sugar syrup for 1 minute apiece and then place them on the serving plate. 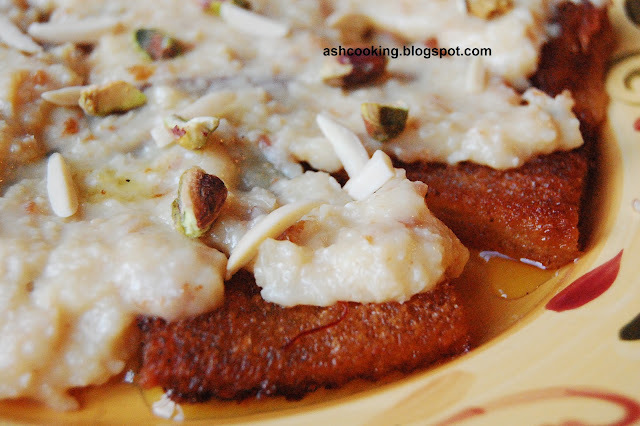 6) Once all the bread squares are transferred to the serving plate gently spread the kheer on top across them. 7) Garnish with slivered almonds and pistachios. It tastes yummy.